An exercise stress test shows your heart’s response to exercise. The test records your heartbeat while you walk on a treadmill or ride a stationary bike. It can be done in a hospital, a test center, or a doctor’s office. 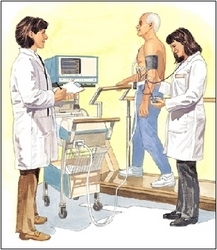 The test is also called astress electrocardiogram (ECG/EKG). Be sure to mention the medications you take and ask if it’s okay to take them before test. Avoid food and drinks containing caffeine. Wear a shirt, blouse, or sweater that you can remove easily. You may be asked to remove your clothing from the waist up. Women may wear a gown. You are then asked to exercise for several minutes. Expect the exercise to be easy at first. It will slowly get harder.